A Farm School NYC Day Trip workshop to Chester, New York. Please note: participants will be responsible for providing their own transportation and bagged breakfast and lunches. 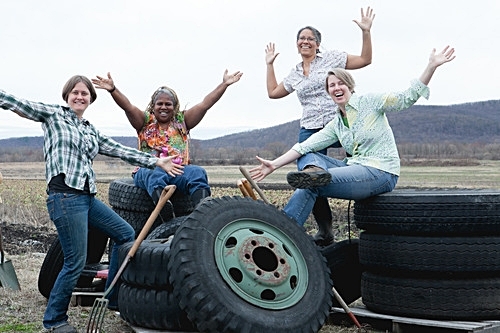 About Rise and Root Farms: Rise and Root Farm in Orange County, New York is managed by four of our talented Farm School NYC teachers, Jane Hodge, Michaela Hayes, Lorrie Clevenger, and Karen Washington. Committed to food justice and building a stronger local food economy for New Yorkers, Rise and Root Farm utilize sustainable farming techniques and offers educational courses for the community. To find out how you can take root with Rise and Root Farm, check out their website and Instagram. About Sunsprout Farm: Sunsprout Farm is located in Chester, New York in the black dirt valley of Orange County and co-owned by Simon Ziegler and Madeleine Banulski. On their beautiful fertile lands, they grow an assortment of vegetables, fruits, flowers, and plants for people in New York, Northern New Jersey, and Southwestern Connecticut. Their products are cultivated through organic and sustainable practices and is accessible to customers at the farmer's markets or the Winter and Summer CSA. To spring into Sunsprout Farm's updates and news, check them out on Facebook and their website!